So when my mate Charlie got in touch, and he was in town for a week, I thought that was just about spot on. Charlie basically spends his summers either in Africa working for charities, or attending weddings. He’s one of those guys that everyone wants to be mates with. Just a top fella. Now all his mates are in their early 30s he’s basically playing out 4 Weddings And A Funeral in real life. He looked like he needed a couple of hours sit down and a beer. We got in about midday and the place was absolutely heaving, which is always a good sign. I really liked the atmosphere in the place. There’s lots of noise and lots of great smells. The décor is pretty cool too, it’s like you’re trapped inside a 1950s Asian comic book. 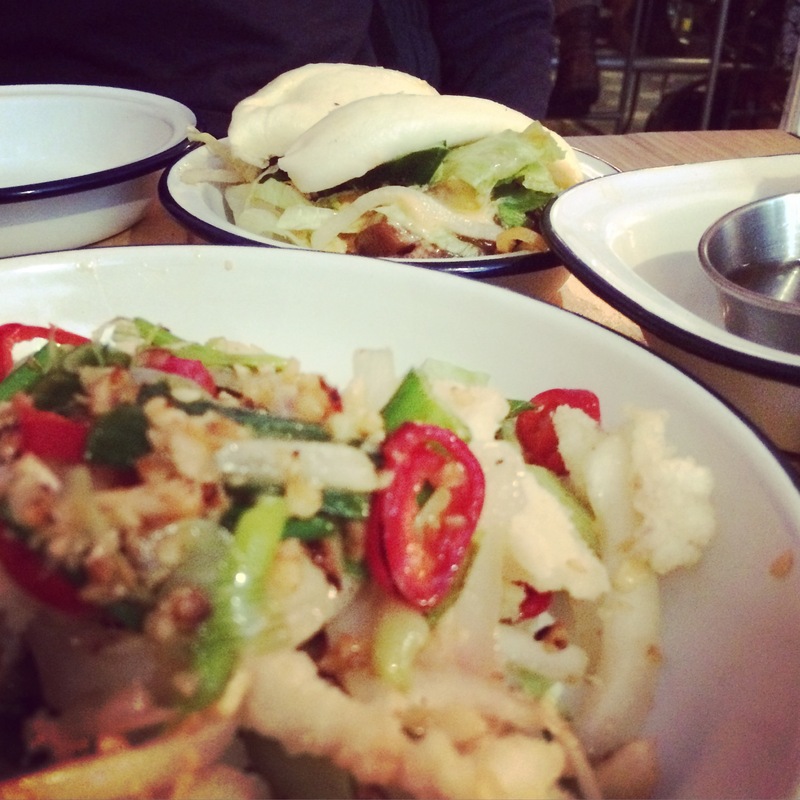 We started with a bit of chilli squid and some steamed buns stuffed with pork and chicken. We had to munch on it fairly slowly, not because the service wasn’t great, more because Charlie took his sweet time working out what he wanted me mains. That was alright by me. The squid was beautifully done; perfectly crisp, with a well measured sprinkling of chilli. The buns were soft, moist, and the meat in the middle just fell apart. For mains I went for the hot and spicy vermicelli stew. Again, beautifully seasoned. Although I did make an unholy mess trying to eat it with chop sticks. Think my technique needs a bit of work. All of it was washed down with some Vietnamese beers. When in Rome and all that! Lots of food, a couple of beers, and a great time spent catching up all for about £40 if I remember rightly. So you liked what I ordered then as I can see. I´ll have that lunch for sure next time. top drawer…. 🙂 Had to smile at thay saying.